Are you looking forward to the next ASSASSINS CREED game? You should be. In addition to the fun to be had playing it's multiplayer option, the score promises to be something special, once again, with JESPER KYD at the composing reigns! Los Angeles, CA - October 27, 2010 - BAFTA award-winning composer Jesper Kyd has composed an original music soundtrack for Ubisoft®'s Assassin's Creed Brotherhood, the next iteration of the critically acclaimed, multi-million selling video game franchise. Assassin's Creed Brotherhood is inspired by historical events during the occupation of Rome by The Borgias in 1503. Kyd's new music score for Brotherhood draws influence and authentic instrumentation from this Renaissance period, immersing players in Ezio's adventures to liberate Rome from a corrupt and tyrant regime. The Assassin's Creed Brotherhood Original Soundtrack will be available for digital download from iTunes on November 16, 2010, to coincide with the North American release of the game on Microsoft Xbox 360® video game and entertainment system and the Sony PLAYSTATION®3 computer entertainment system. "Researching the history of the Borgia Family it became clear early on that Assassin's Creed Brotherhood would require a very dark score in order to match the Borgias' aspirations to become the rulers of Italy. The music reflects the compelling story of Ezio as a Master Assassin going up against the Borgias," said Kyd. Kyd's globally acclaimed score for Assassin's Creed® 2 continues to receive top honors for Best Original Music including the Gold Spirit Awards, Hollywood Music In Media Awards, GameSpot Readers' Choice, GameSpy Editors' Choice, Game Audio Network Guild Awards as well as recognition from the British Academy of Film and Television Arts, Academy of Interactive Arts and Sciences, International Film Music Critics Association, Golden Joystick Awards and Spike TV VGAs. In Assassin's Creed Brotherhood the critically acclaimed single player experience of Assassin's Creed is back and better than ever as Ezio returns in an enduring struggle against the powerful Templar Order. Now a legendary Master Assassin, he must journey to Rome, center of power, greed and corruption to strike at the heart of the enemy. Defeating the corrupt tyrants entrenched there will require not only strength, but leadership, as Ezio commands an entire Brotherhood that will rally to his side. Only by working together can the Assassins defeat their mortal enemies. Assassin's Creed Brotherhood is also the first time the franchise has featured a multiplayer gameplay experience, which has already received numerous industry awards. Assassin's Creed Brotherhood is a worldwide production effort led by the Ubisoft Montreal development studio in collaboration with Ubisoft studios in Singapore, Bucharest, Québec City and Annecy. 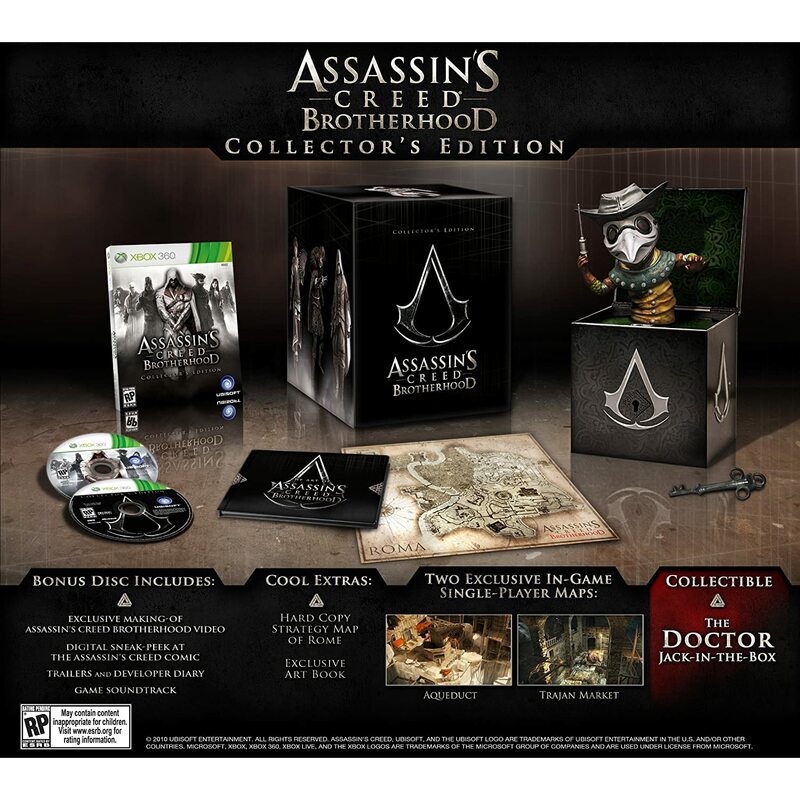 Assassin's Creed Brotherhood will ship on November 16, 2010 for the Microsoft Xbox 360® video game and entertainment system and the Sony PLAYSTATION®3 computer entertainment system. 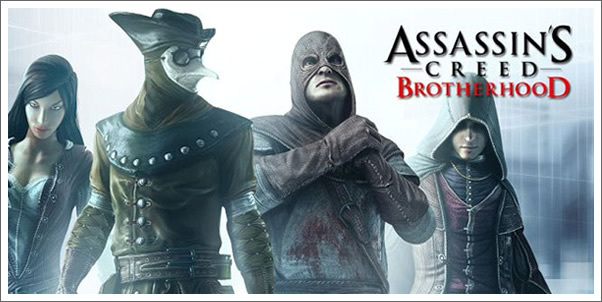 For more information about Assassin's Creed Brotherhood, please visit, please visit www.assassinscreed.com.